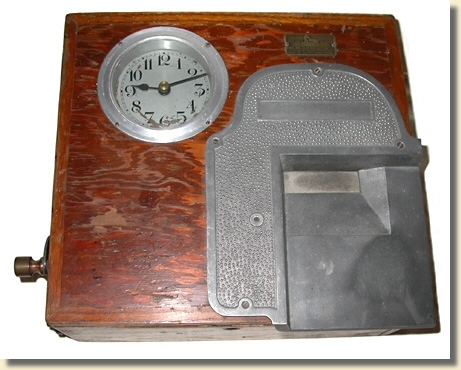 This clocking-in clock is suitable where there are a small number of employees, or where there are irregular work patterns. The times are recorded in a single colour on a paper roll. The lever at the left is pushed and held down which opens the small rectangular signing aperture. The employee signs and when the lever is released, the shutter covers the signature and the paper roll is advanced ready for the next employee. The time of clocking in is printed on the paper roll beside the signature. 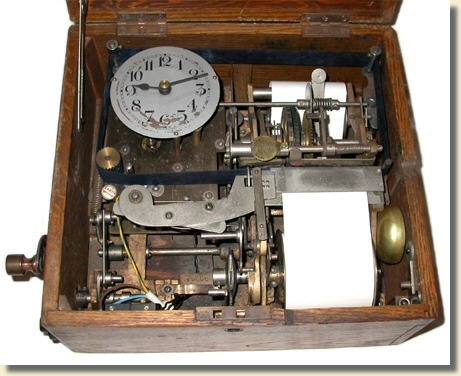 The mechanism is made by National Time Recorders Ltd (of Kent, England) and is driven by a mains synchronous motor.